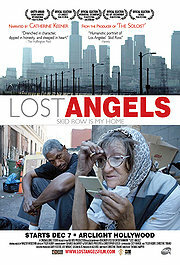 A documentary film about the homeless in Los Angeles might seem like the most clichéd subject one could come up with in an age where filmmakers are taking their cameras into every nook imaginable, and certainly 2010’s Lost Angels: Skid Row is My Home lacks any of the clever hooks that have re-invented the genre over the past two decades… yet, in this case, that’s actually a plus. Combining your standard talking-head interviews with your standard B-Roll snippets of L.A. street life, Lost Angels does exactly what documentaries were supposed to do back in the day: document an important aspect of our civilization in as straightforward fashion as possible. “The homeless” is actually a misnomer, because several of the subjects profiled in Lost Angels technically have a home, albeit one most people would shudder to live in. The film is actually about L.A.’s Skid Row, a geographically-shifting, gentrification-threatened patch of the city where many lost souls have ended up in. Director Thomas Napper gives several of them center stage, including a guy who spends every day sweeping up the neighborhood’s streets, a woman who’s taken up the task of feeding all of Skid Row’s stray cats, and an ex-Olympian who’s pursuit of drugs robbed him of an athletic career and landed him here, on the sidewalk of LA’s most maligned neighborhood. Narrated by actress Catherine Keener, Lost Angels sticks to giving us just the facts, letting the content itself take center stage, without any cinematic flair. To its credit, the film is never boring, despite following such a formulaic approach. It briefly covers the history of Skid Row, discusses the political issues surrounding this marginalized sliver of society, and champions the myriad stories of humans rising above their environment to create a genuine home for themselves in a place most “respectable” people would never step in. It is these stories that make the film worth watching, humanizing the “crazies and weirdos” most urbanites have learned to ignore during their daily commutes on the subway and sidewalks of city life. As a bonus features, the DVD contains a commentary track providing more insight into the making of this noble project. I have to convey my love for your kindness in support of individuals who must have help with the question. Your personal dedication to passing the message across turned out to be amazingly important and have in most cases allowed guys and women much like me to reach their pursuits. Your own invaluable publication means a whole lot to me and substantially more to my office colleagues. Many thanks; from everyone of us.